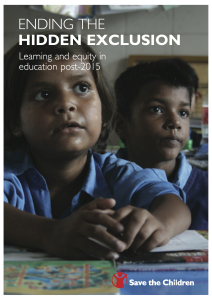 Save the Children published a report entitled Ending the Hidden Exclusion: Learning and equity in education post-2015. Below, excerpt of a post on the Education for All blog which discusses aspects of the report. Additional thoughts and questions are offered at the bottom of this post for further discussion with the UKFIET Community of Practice. The Millennium Development Goals (MDGs) and much policy thinking in recent decades have rightly focused on an obvious and invidious exclusion – the large number of primary school age children who are still out of school. But now we need to focus much more on a “hidden exclusion”: children who are in school but learning little or nothing. Is the notion of “effective enrolment” – as used by Nicholas Spaull at the University of Stellenbosch – a good way of capturing the degree of hidden exclusion in different countries? What are some alternative options? If the post-2015 development framework did develop a “gap narrowing” target, what are the key policies which would be needed to achieve it in the future? Do we know enough about how best to narrow gaps in educational outcomes, while also improving the overall levels of learning? For example, how important is the development of more targeted funding systems, with money being allocated according to need? This might be especially important given that the costs of providing a high quality education may be higher for some of the most marginalised children. Where do you stand on the questions posed? Important questions to consider. The increased focus on ed quality/learning is welcome and urgent. But also important is to not lose sight of the fact that in a handful of countries, access remains an enormous challenge. A corollary issue to the “access vs learning” debate (if it must be called that) is how many of the 61 million ‘out of school’ children actually ARE out of school versus enrolled in private or religious schools, and if they are in such schools, what is the quality of education they are receiving? Hi Charlie. Thanks for taking the time to read the blog. The question of the number of children in private schools – and concerns about these being unregulated and therefore low quality/risky in some instances – is massive. In our report (see http://www.savethechildren.net/sites/default/files/libraries/Ending_the_hidden_exclusion_full_report.pdf ) we discuss this in some detail. See pages 11-14. We argue the case for better regulation. But we also say that the ‘flight’ to the private sector should act as a wake-up call to policy makers about the need to redouble efforts to improve quality of publically funded schools. ‘Hidden exclusion’ (HE) is a new way of looking at what happens in teaching and learning. The extent to which basic concepts/competencies at the primary level, the critical stage of taking off, are understood by the child can be identified by the teacher becomes very important. I would go a step further and call it ‘education of the poor and powerless’ for which we have to undertake a holistic and integrated approach in primary education, specifically in the rural disadvantaged areas. To achieve the EFA goals, the issue of quality education must be raised. The concept of Hidden Exclusion is very much obvious in developing country like India. The low fee private schools, religious schools and poorly managed public/government schools, have the poor quality of education. Recently, the Govt. came with indicators for learning outcomes, but in lack of sufficient budget, regulation and innovative curriculum, quality education may not be ensured. An effective advocacy campaign is needed.